The Adidas Solar Boost is a highly cushioned daily trainer with a accommodating fit for most foot types. While this isn't a shoe for faster paced running, most runners will appreciate its plush ride and fit for recreational runners to high mileage hogs. The Adidas Solar Boost is a shoe that will accommodate all types of runners, from beginners to experienced runners. What it is not recommended for is faster paced running due to its heavier weight (10.6 ounces) and a rather unstructured fit. The Adidas Boost line has experienced somewhat of an identity crisis over the past few years. 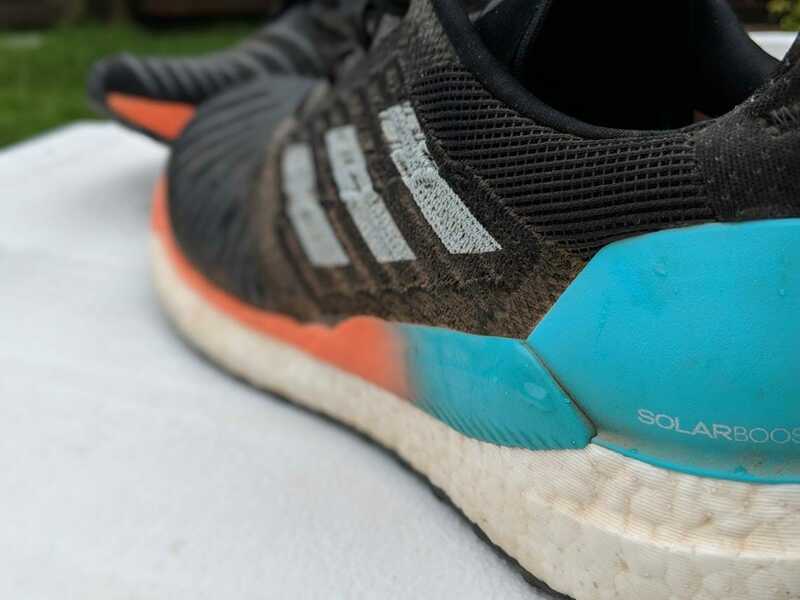 Going back to the highly lauded Energy Boost, Adidas has transitioned to the Ultra Boost which this reviewer did not think provided enough upper support, to the new Solar Boost line which seems to aim at remedying this problem. Whereas the Ultra Boost offered a sock-like, but unstructured fit using Adidas’ Prime Knit, the Solar Boost adds additional support through the midfoot as well as some structural support with a guidance system. 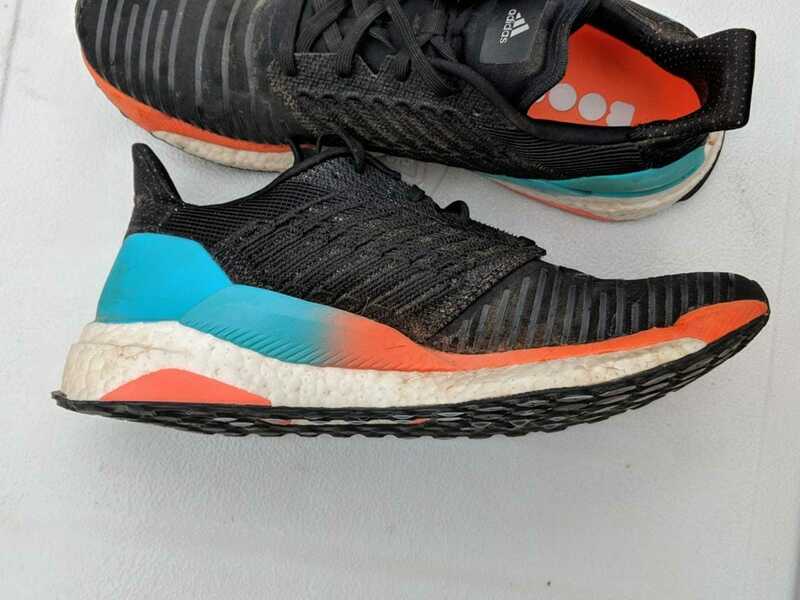 It seems that while Boost may be one of the best TPU cushioning technologies on the market, adding support without ruining the resilience and pillow like feel of this cushioning seems to be difficult. For those of you who aren’t complete shoe geeks, TPU foam is comprised of tiny pellets compressed together to yield greater energy return and durability than traditional EVA foam that is a solid piece of foam. 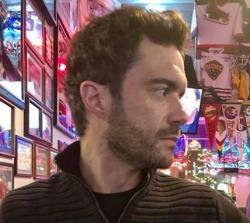 Think styrofoam versus packing peanuts. Adidas has tried various methods of adding structure and support to these high end Boost shoes, and now they have returned to the Torsion System which has been in use in Adidas shoes since the late 1990s. The Adidas Solar Boost seems to be the functioning runner’s shoe in the Adidas line for runners looking for premium cushioning. It sits only below the Ultra Boost, which functions best as a lifestyle shoe, in terms of cushioning. Comparable shoes from other companies include the Hoka One One Bondi, the Asics Nimbus, Nike Vomero, and Brooks Glycerin. In my initial unboxing of the Solar Boosts I noticed that the shoe had a much more secure fit than the Ultra Boost and a fantastic look with an all black upper flanked by pastel highlights that popped. In terms of simple aesthetics, its always hard to compete with an Adidas shoe as the iconic three stripes pattern resonates so deeply and historically with running history going back to the 1930s. Since we’ve already discussed Boost TPU cushioning, you have an idea of the resiliency and durability of this foam. I’ve been a fan since it’s inception, but my dream of a perfect full length Boost shoe seems to be more difficult for Adidas engineers than anticipated. However, the Solar Boost is as close as Adidas has come to yielding highly cushioned full-length boost shoe that actually feels like a high mileage shoe. In fact, this feels more like the original Energy Boost than anything else which begs the question as to why mess with a good thing? The Boost midsole is supported with the aforementioned Torsion System as well as Solar Propulsion Rails (the orange and teal parts) along the sides of the upper. While I was initially skeptical, the technology works together to provide a nice flexible, but supported, feel. 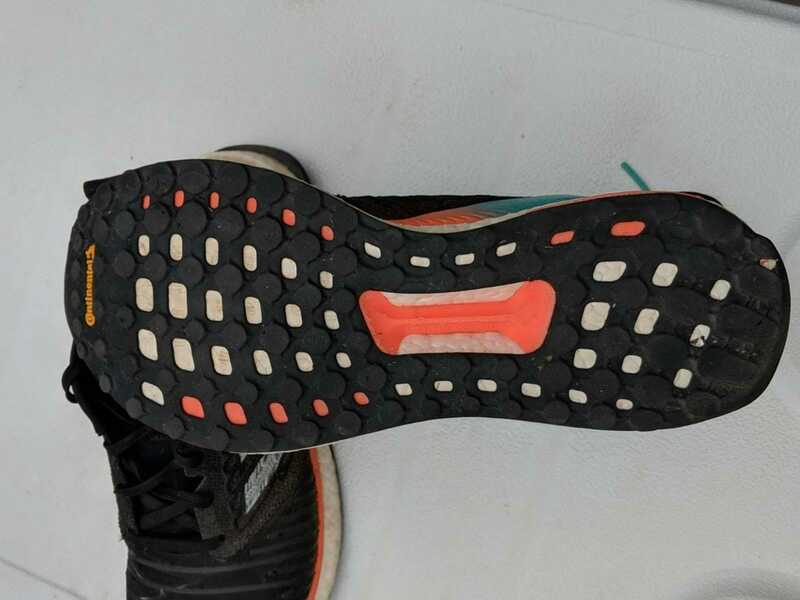 In fact, I was very surprised with the amount of flexibility the Solar Boost has while running, and this supports my biggest gripe about this midsole. As a mid-foot/ fore-foot striker I appreciate a lot of forefoot cushioning. On paper, the Solar Boost has it with 28mm of cushioning in the heel and 18 in the forefoot. But, running on pavement this forefoot cushioning seems to compress and feel unsubstantial at longer distances. The outsole is made of Continental rubber and has great grip and surface area in all conditions. This is a relationship that I hope Adidas continues, as this Continental outsole seems to last well over 500 miles. This is an area where the Solar Boost improves on any other Boost upper, to a point. Tech Fit is an elasticized material that appears non-porous and solid that provides a customized fit. I have a wide forefoot and the Tech Fit seemed to mold to my forefoot without squeezing the foot at all. I thought that this upper would overheat my foot while running, but after runs in 90 degrees plus this summer it breathes surprisingly well. Tailored Fibre Placement is another new Adidas technology that creates a web of sorts of knit fibers along the midfoot that has a locked down fit. 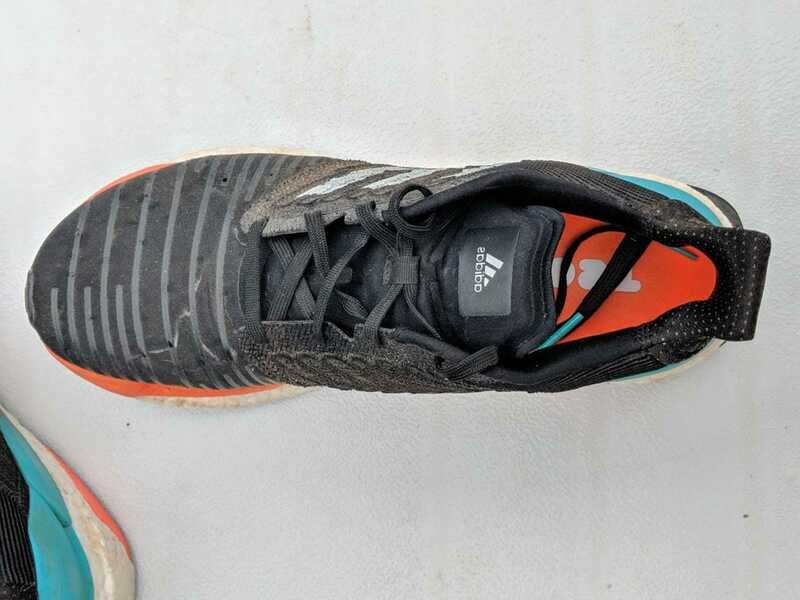 Where the upper may cause frustration is in the heel cup which employs Adidas’ Fit Counter technology aimed at reducing pressure on the achilles tendon. I found that this technology didn’t bother me at all, and the plush heel collar was nice. However, when going uphill, the heel tended to slip quite a bit. Runners with narrow heels will struggle with this technology, and runners needing structural support will also be frustrated. I feel like there is a compromise between a complete lack of structure and a shoe that is over-built and a totally floppy heel cup. The Adidas Solar Boost is a move in the right direction for the high end Boost line, and one that may find serious runners caught by surprise. The Ultra Boost is a lifestyle shoe at best, and I know runners that scrounge for the now out of stock Energy Boosts. At a weight of 10.6 ounces (men’s size 9) Adidas isn’t exactly keeping up with the Jones’ as far as lightweight cushioning technology. There is a reason that most serious, high mileage runners continue to choose Adidas’ Adizero line for both training and racing. The shoes use Boost midsole material, but the Boost is bolstered by firmer, more structured EVA. The uppers are no nonsense mesh that is both locked down and durable, and the Adizero shoes will take a serious beating. I hope that Adidas can take a maximal Boost shoe and add an Adizero, no nonsense, upper that I can buy for $120 in the future. 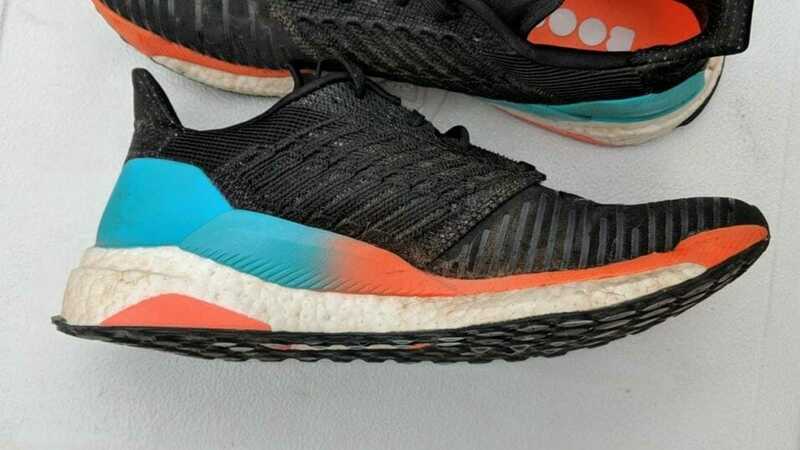 I think runners have seen too many incarnations of the Energy/Ultra/Solar Boost line to really give it a chance anymore. We purchased a pair of Adidas Solarboost from runningwarehouse using our own money. This did not influence the outcome of this review, written after running more than 50 miles in them. Haloo! Thanks for the review. How many km’s do you reckon one gan get on this shoe? 800-900km?